October is National Disability Employment Awareness Month in the U.S., established more than 70 years ago to celebrate the contributions of workers with disabilities. 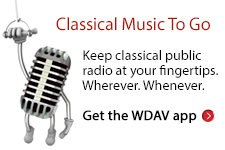 Throughout the month, WDAV highlighted classical musicians with disabilities who have left an indelible mark on the arts. In addition to this on-air focus, we partnered with Davidson College students in Professor Neil Lerner’s seminar on music and disability studies to produce a blog series highlighting composers and performers with disabilities. We also turned to the community to discover what role music might play in serving individuals living with disabilities. We spoke with Meg Johnson, Music Therapy Clinical Coordinator for the Queens University of Charlotte, who provided insights into her use of music therapy.